Because the relationship between the observed flow record and the tree-ring chronologies used in the single predictor tended to be non-linear, the observed records was transformed into log 10 units prior to calibration. Linear regression was then used to calibrate the log-transformed observed flow record with a single predictor, which was the simple average of 17 tree-ring chronologies from Colorado, northern New Mexico, and southeast Utah that spanned the period 1450-2002. The residual chronologies, with the low-order autocorrelation removed, were used. Validation statistics were computed using a leave-one-out (cross-validation) approach. After calibration and validation, the reconstructed flows were back-transformed from log units to the original units (acre-feet). Figure 1. 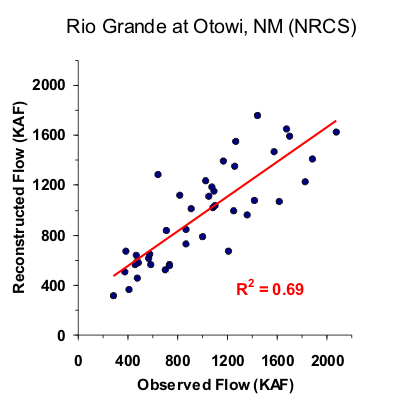 Scatter plot of observed and reconstructed Rio Grande annual flow, 1958-2000. Figure 2. Observed (black) and reconstructed (blue) Rio Grande annual flow, 1958-2000. The observed mean is illustrated by the dashed line.